Capitalist economies need strong central management. A key management role: to modify the wild swings from “boom” to “bust” that inevitably result when many risk-taking competitors pursue their different economic interests. Only national governments can manage national economies in a way that most competitors will accept as reasonably fair. And as corporations and the private economy grow larger, only a strong government, able to invest and spend enough on its own to make a difference in the overall economy, can do the job. It took about one hundred fifty years for the first U.S. government, business and labor leaders to understand the need for central economic management, and still longer to learn how to do it right. For many years, for example,everyone believed the government could only print an amount of money equal to the gold bullion it held, at Fort Knox or elsewhere. One effect of tying the government’s hands in this way was that economic Panics and Depressions came and went, with the government doing little or nothing to make things better. Then during the Great Depression of the 1930’s, we learned a couple of new things, mostly by accident. First, many of us learned that a national government can help get us out of a Depression by spending more than it has in bullion, and more than it collects in taxes. For the first three years of the Depression, Republican President Herbert Hoover did what the “experts” of his day thought he should do: he cut government spending sharply, because the government was collecting less in taxes. And things got worse and worse. One quarter of the former workforce was out of work. Many thousands hit the road as “tramps,” hitching free rides on freight trades, and sleeping in corn cribs. And many banks didn’t have enough money to pay all their debts. When he ran against Hoover for President in 1932, Franklin Delano Roosevelt (FDR) promised more of the same cost-cutting as Hoover – but when he took office, he did something dramatic and different. He began by closing ALL the banks for a few days, and then allowing only the solvent banks to reopen. Now, people who had some money felt safe to put it in a bank again, where it could be loaned out to buy goods or grow businesses. Then, the U.S. went off the “gold standard” altogether, with the government spending as much as was needed to address the nation’s problems, especially unemployment and farm bankruptcies. And things got better! It turned out that a dollar was still worth a dollar as long as retailers and bankers were willing to give you goods or interest for it. Trust was what mattered. Gold became just one more product on the market. Even more importantly, FDR also did what he had done before on a small scale, as Governor of New York: when he saw a lot of people out of work, he hired them to work for the government. They cut trails through forests, built dams that produced electricity, built a lot of train stations and public buildings. This put money in their pockets. Of course, the workers on those projects spent every penny they earned as fast as they could. That meant other Americans now found money in their pockets. Usually, they also spent it as fast as they could, and so on. In that way, over the course of a year, each new wage dollar added multiple dollars to the economy, which started to grow again. The Roosevelt Administration, and the Congress, also started a number of new programs to put money in the pockets of ordinary people, including Social Security, a minimum wage, unemployment insurance, and a National Labor Relations Board. These programs, besides boosting the economy, addressed the radical inequality between huge corporations and individual workers, and between people of property who could live without work, and former wage workers who had no income in old age or unemployment. With all this new purchasing power in people’s pockets, the economy began to GROW again. The government had “primed the pump,” and the private economy began pumping again on its own. With all the new economic activity, tax collections also rose. By 1937, people figured the Great Depression was history. All that spending by the government was no longer needed! So the Roosevelt government cut spending way back – and we went back into recession! 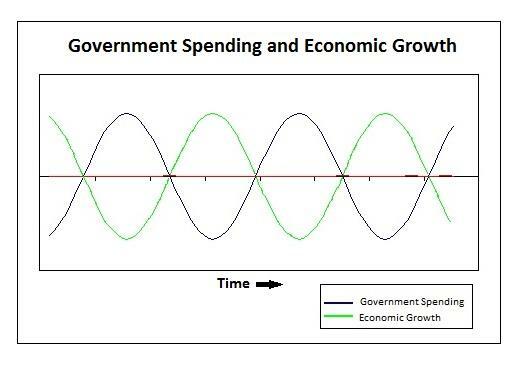 It turned out we had cut government spending too soon and too far for an economy that was still in recovery. At this point — unfortunately for the world, but fortunately for the U.S. economy – Hitler, Mussolini and Tojo launched a war to take over the world. To build weapons and pay soldiers and sailors, the U.S. turned to really huge levels of deficit spending. 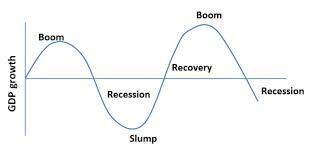 The economy recovered for good this time, and grew quickly, year after year, long after the war was won. We were finally out of the Depression. We began thirty years of huge growth (with occasional short recessions), which was widely shared with a new kind of people – the American Middle Class: blue collar and service workers with money in their pockets. Before and after Roosevelt and the war, a British economist, John Maynard Keynes, had written books explaining how a government should manage the economy, and why. His new theory, “Keynesian economics,” called for deficit spending as a way to get out of recessions, just as the Roosevelt Administration had done for its own reasons. Keynes also said government deficits should be cut when the private sector was booming. Now, confirmed by Roosevelt’s actions, Keynes’ theory became the guide to government economic management from that point forward. Many business people, and other conservatives, were offended by the idea that government could borrow and print the money it needed to pay its debts. They saw that competition from government “make-work” tended to increase the wages they had to pay to hire employees. They worried that government might have more power than they did. 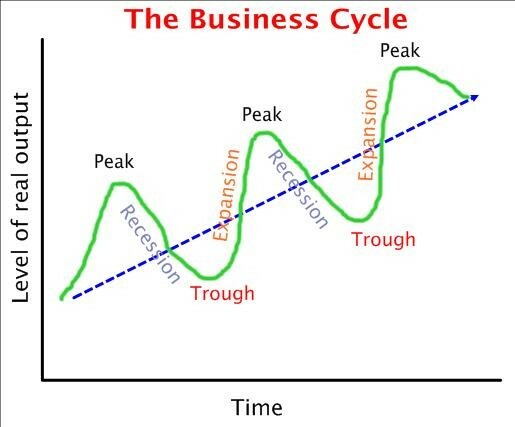 But as the new system prevented downturns from becoming Depressions, growth benefited business along with everyone else, so they grumbled all the way to the bank. In my next blog, we’ll look at some pictures of how this system works.